MassDOT Secretary Tours Lanesborough's Narragansett Bridge Project - J.H. Maxymillian, Inc.
LANESBOROUGH, Mass. — Some 150 households in the Narragansett Avenue neighborhood depend on one single bridge to get in and out. It’s their only access. And as they commute over it, often they’re slowing down and veering lanes to avoid the anglers who have plopped down a chair in the lane. The narrow road didn’t have much for parking, and that is where many with kayaks and canoes would park to get into Pontoosuc Lake. Anyone who was walking or bicycling had to share what was left of the roadway. As of next year, all of that will be taken fixed. Workers are able halfway through what turned into a four-year project to replace the Narragansett Avenue causeway bridge. Last summer, a temporary bridge was installed and this summer Maxymillian is building the new one. “It is approximately a $7 million project. It is supposed to be finished by November of 2019. But that includes ripping out the old bridge. So hopefully, we can open the new one. This, as early as next summer, will be a totally functional bridge and then they take the temporary bridge out,” Town Manager Paul Sieloff said. Sieloff said the bridge was in poor condition but there was no way for the town to handle the construction costs itself. The state Department of Transportation took responsibility for the entire project. 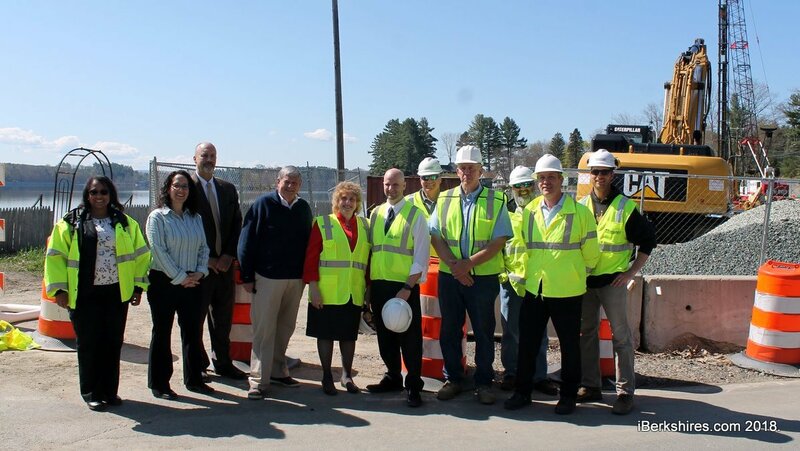 On Tuesday, MassDOT Secretary Stephanie Pollack stopped by the see the progress firsthand. “This is one of the billions of dollars of projects the Baker-Polito administration is doing across the state. What we always look for are transportation projects that are important for the roads and bridges, but also important for the communities,” Pollack said. “Here we have a situation, we had a very old bridge in tough shape, there are 150 houses on the other side where if anything happened to the bridge they’d really be isolated, and we also had an opportunity to widen out the bridge. The new bridge will sit on an arch, replacing what was two pipes underneath the bridge. It will feature a sidewalk and a bicycle lane. The town is gearing up for another project once the bridge is completed to build four to six parking spaces right next to the popular fishing spot. “A lot of people going fishing here. They’d bring chairs and be in the middle of the road. You had to be really careful. Now there is a place people can come and sit. There is a sidewalk. It is going to be safe for everybody,” said Mass DOT District 1 Director Francesca Hemming. That the bridge sat on pipes gave Pollack a bit of a chuckle, but it isn’t the oddest bridge she’s seen in Western Massachusetts. “You have bridges that are much more interesting. This one was built on pipes. Last year, I saw one that was built on trees by the Conservation Corps in the 1930s. In eastern Mass, they are more standardized,” Pollack said. The process to get a shovel in the ground was a challenge. The town needed to secure some 18 different easements from property owners who owned property MassDOT needed either access to or to permanently take land. The town paid out some $50,000 to reach those agreements. And there, there was a secondary challenge, five pieces of land around the bridge were in protected by Article 97, which places a restriction for conservation and requires a two-thirds vote of the Legislature to remove it. Then state Rep. Gailanne Cariddi tried to usher that bill through. But, time was short as the legislative session was coming to an end. Ultimately, there was a legal question from the secretary of state’s office about it being “navigable water” and it needed approval from that office. That ultimately led to the bill not making it to a vote before the end of the session. It was carried over into 2017, when Cariddi re-filed it months before she died. Meanwhile, MassDOT had enough to award the bid and build the temporary bridge. That piece of legislation sat on Beacon Hill for a period of time without a representative pushing it along. Construction managers on site Tuesday said the work hadn’t gone perfectly smooth either but the project remains on schedule for reopening next year. Pollack said Article 97 restrictions are something MassDOT runs into often. The restriction is in the state’s constitution, so there is little MassDOT can do to avoid the legal requirements. But, Pollack said the department’s permitting staff is able to help towns navigate that process. The bridge isn’t terribly large but the replacement poses a significant financial challenge to the town. “It is a challenge because we only get about $225,000 in Chapter 90 and you’re looking at millions of dollars. We have to look for a special appropriation from the state or federal money to get these bridge projects done because they are so large and expensive,” Sieloff said. Pollack said that was something she heard since her first day as secretary. And she said MassDOT has placed a priority on repairing the state’s bridges. “Previously we were focused on our bridges but one of the things that I heard from the very first time I became secretary and came out to the Berkshires was that some of these town-owned bridges are a real problem, in bad shape, and the communities didn’t have the resources to tackle them by themselves,” she said. The entire project is still on schedule to be completed next November. Lanesborough particularly has been making progress on many of its small bridges. Both the Minor Road Bridge and the Putnam Street bridge had been replaced in the last few years. Those were after repairs to the Bridge Street bridge. Sieloff said a number of culverts in town were also replaced. Sieloff said the town just recently added bridges to the 10-year capital plan. But finding the money to pay for the actual work is challenging. “Thankfully they are paying for the entire construction cost, there is no hit on the town at all, which would have been catastrophic financially,” Sieloff said. In recent years the state has recognized the need and created a small bridge program, which is a pool of money specifically eyed for small bridges and culverts. That is on top of projects like the Narragansett Avenue bridge. Instead of MassDOT taking over the construction completely, that program provides towns with money to repair their own bridges through a competitive grant process. “We are trying to invest more in those assets and get our bridges in better shape,” Pollack said. Pollack said she is also looking into ways to make the permitting, design, and construction quicker. Particularly in small towns, many have asked to have essentially “off the shelf” bridge designs. Oftentimes the towns are asked to design a bridge before MassDOT releases construction money. That has posed a challenge for some because engineering costs add up. Pollack has heard that suggestion too but said crafting such designs is easier said than done. But, she hopes to find some ways to make it easier. “We have talked about trying to standardize it more but it turns out to be harder than you think because every place is a little bit different. But it is something we will take a look at because the more we can streamline the money we have to put into engineering and design, the more we can put the money into more projects. And ultimately, that’s what people want,” Pollack said.